How should I design my VPC? Amazon Virtual Private Cloud (Amazon VPC) offers a comprehensive set of virtual networking capabilities that provide AWS customers with many options for designing and implementing their AWS network. However, it can be difficult to decide on an ideal network design for your organization from among the various network strategies and configuration permutations, especially for customers who do not have dedicated network professionals to design, size, and manage their networks. This webpage provides AWS customers with high-level VPC design best practices and guidance, and outlines the most commonly used individual VPC configurations. The following sections address key considerations and recommendations for designing and sizing individual VPCs, and assume some basic knowledge of network addressing, subnetting, and routing. Ensure that your VPC network range (CIDR block) does not overlap with your organization’s other private network ranges. Do not allocate all network addresses at once; instead ensure that you reserve some address space for future use. Divide your VPC network range evenly across all available Availability Zones (AZs) in a region. Create one subnet per available AZ for each group of hosts that have unique routing requirements (e.g., public vs. private subnets). Size your VPC CIDR and subnets to support significant growth for the expected workload(s). As you decide on an appropriate VPC design, you will need to consider both how you plan to leverage AWS from a user, backend system, and routing perspective, as well as estimate your current and future network sizing needs. Keep in mind that you can easily change your VPC design from one configuration to another, especially if you follow the best practice of reserving some address space for future use. 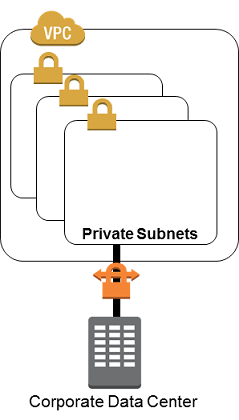 For example, you can add private subnets to the Internet-Accessible VPC design described below to create a Public and Privately Routed VPC design. However, keep in mind that you cannot resize a VPC or individual subnet once you create it. User Access: Who needs to access the resources in the network (internal users, external users, or both)? Systems Access: What additional systems (internal, external, or shared) does this workload need to interact with? Routing: Do you need different hosts to route traffic in different ways (e.g., internal-only vs. public-facing hosts)? Based on the answers to these questions, individual VPCs are typically deployed in one of these common configurations. This design pattern is primarily used for test, R&D, sales demo, production, and other environments that require a network environment that is completely isolated from a customer’s internal network. This design is appropriate for customers who want to ensure that AWS resources within this network never have private network connectivity to internal systems. Any user (internal or external) accessing resources in this VPC must do so over the Internet. AWS resources within the VPC network can be granted access to other publicly addressable systems on the Internet. AWS resources in this environment all share the same routing requirements and leverage an Internet Gateway and AWS-provided Internet connections. AWS resources within the VPC network will not be able to connect directly to the customer’s internal systems and networks using private IP addresses. This design pattern is used to create a network environment that has the ability to communicate with both internal (privately routed) and external (publicly routed) resources using a combination of public and private connections. This design is ideal for workloads that need to accommodate a combination of public and private routing needs, such as all-in Internet-facing, multi-tier web applications supported by databases or other privately routed backend systems. This design pattern supports both internal and external users and can leverage either private network connections or AWS-provided Internet connections, depending on what makes the most sense for the given workload. 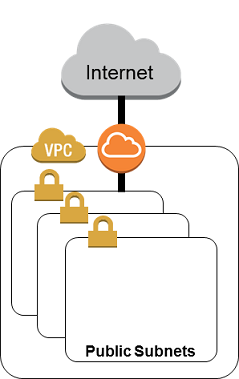 AWS resources within the VPC network can be granted access to internal and external systems and can leverage either private network connections or AWS-provided Internet connections, depending on what makes the most sense for the application and workload. AWS resources in this environment should be grouped by unique routing requirements and deployed to appropriate public or private subnets to ensure both internal and Internet traffic will be routed properly. Designs that support both internal and external network communication might require additional network controls to protect both AWS and internal systems. See the Controlling VPC Egress Traffic Solution Brief for additional information. Additionally, this design is often incorporated in a larger, all-in network design involving multiple VPCs. This design pattern is used to create a network environment that has the ability to communicate with both on-premises (privately routed) and external (publicly routed) resources using a combination of private connections and AWS-provided public routing. This design is ideal for Internet-facing workloads that need to interact with a customer’s internal network and on-premises systems, internally facing systems that can benefit from AWS-provided Internet connections, or any other workload that requires a combination of public and private routing. 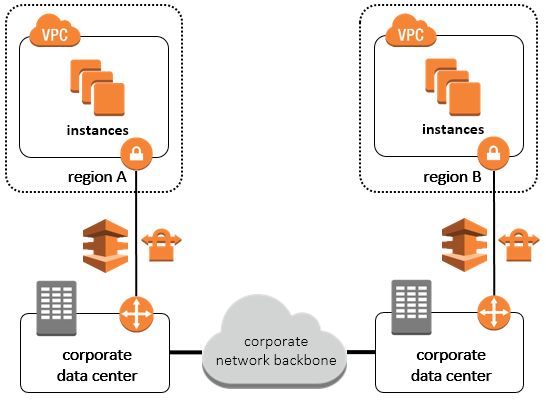 This design pattern supports both internal and external users and can leverage either private network connections or AWS provided Internet connections, depending on what makes the most sense for the user’s location and network connectivity. AWS resources within the VPC network can be granted access to internal and external systems and can leverage either private network connections or AWS provided Internet connections, depending on what makes the most sense for the application and workload. AWS resources in this environment should be grouped by unique routing requirements and deployed to appropriate public or private subnets to ensure both internal and external traffic will be routed properly. This design pattern is used to create a network environment that is only accessible from an existing, internal network, such as internally facing or back-office systems. This VPC design is appropriate for customers who want to utilize their own Internet Service Providers to control all Internet-based traffic, and forgo AWS-provided public IP addressing capabilities. Any user (internal or external) accessing resources in this VPC must do so over the customer’s existing, internal network and customer-managed Internet connections. AWS resources within the VPC network can be granted access to a customer’s internal systems and will leverage the customer’s Internet providers for all publicly routed traffic. AWS resources in this environment all share the same routing requirements and leverage VPN or Direct Connect connections to communicate with the customer’s internal network. Amazon Elastic Compute Cloud (Amazon EC2) instances in this VPC will be able to access Amazon Simple Storage Service (Amazon S3) through VPC endpoints. However, access to other AWS publicly addressable services must traverse the customer’s internal network and Internet connections. VPCs can vary in size from 16 addresses (/28 netmask) to 65,536 addresses (/16 netmask). In order to size a VPC correctly, it is important to understand the number, types, and sizes of workloads expected to run in it, as well as workload elasticity and load balancing requirements. Keep in mind that there is no charge for using Amazon VPC (aside from EC2 charges), therefore cost should not be a factor when determining the appropriate size for your VPC, so make sure you size your VPC for growth. Moving workloads or AWS resources between networks is not a trivial task, so be generous in your IP address estimates to give yourself plenty of room to grow, deploy new workloads, or change your VPC design configuration from one to another. The majority of AWS customers use VPCs with a /16 netmask and subnets with /24 netmasks. The primary reason AWS customers select smaller VPC and subnet sizes is to avoid overlapping network addresses with existing networks. * Note that the Hosts/Subnet and Total IPs columns in the above table exclude the five (5) IP addresses from each subnet that are unavailable for use. See the Amazon VPC documentation for detailed information about subnet sizing.